Yikes! It appears that my monthly reading list is shrinking as the year progresses! At least I was balanced. I read two fiction books this month. I also read two nonfiction books. The girls and I began Heaven to Betsy by Maud Hart Lovelace as our bedtime read-aloud. I loved all of these books when I was growing up, but I had forgotten how much Betsy’s high school life focused on the boy/girl relationships. No need to encourage that too much around here yet! We will finish this one, but I’m going to save the rest of the series for when the girls are older. I need to get back to my scheduled read-aloud list. We’re also still trying to read aloud after lunch most days, like we did during our homeschooling year We’ve just finished The Landing of the Pilgrims by James Daugherty. At least I feel like we’re getting a bit of education this summer! Thanks for the heads' up about Heaven to Betsy. 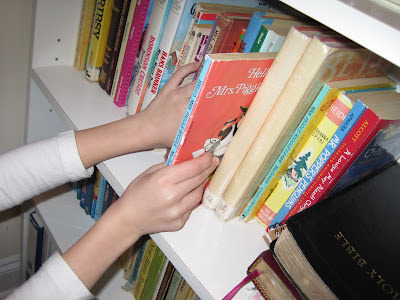 My oldest daughter loves the Betsy-Tacy books, and I think the next one for us is Heaven to Betsy. If so, I think we'll save it for later…much later. I don't know that my six year old will appreciate that, and as her mother, I know that I won't!